Surgical modification of the GIT gives new opportunities for the study of the GI microbiota. Using surgical procedures, specific parts of the GIT can be removed in order to make modifications to basic physiology. Surgery can also provide the opportunity, by means of cannulation of the GIT, to give repeated post-surgical access to specific sites of the tract. The human GIT lacks some of the areas that may be found in the rodent and porcine GIT, such as the areas of non-secreting epithelium that are found in the stomachs of rodents and pigs. It has been suggested that these areas are the primary sites for Lactobacillus colonization within such animals, and that bacterial populations contained at these sites are in fact seeding the intestinal tract with lactobacillus (104,105). If this was to be correct, removal of the non-secreting stomach region could result in a gastric microbial profile that is more in line with that of the human. However, surgical removal of the non-secreting stomach region has no effect on the luminal levels of lactobacillus in either the stomach or in the colon of mice (A. Henriksson, unpublished observations). Therefore, it can be assumed that in mice and possibly other animals, this region is not responsible for the relatively dense lactobacillus populations found in either the intestinal contents or the stomach itself. 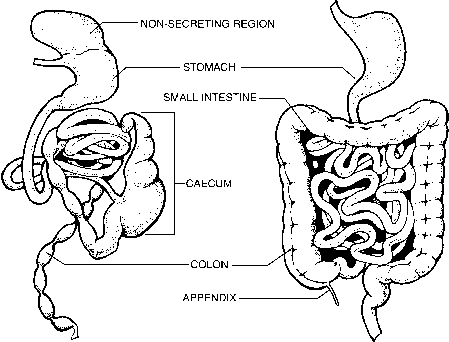 The caecum is an important part of the rodent intestine for microbial fermentation. This stands in contrast to the human GIT where the colon is the major site for such fermentation. It has been suggested that this difference is another factor that contributes to various differences between the microbial profiles of rodents and humans (106). However, studies indicate that the microbial biochemical profile of caecectomized mice remains significantly different from that of normal humans or mice (106,107). Most studies on rodents with surgically modified GIT have failed to give microbial profiles that closely resemble that of the human GIT. Cannulation is performed to provide access to specific sites of the GIT in order to facilitate collection of microbiological samples. Cannulated animals are equipped with a port from which samples can be taken at one or several sites along the GIT. Cannulation has been performed on dogs, pigs, and other larger animals (108-110). This technology has been valuable in assessing the microbial and enzymatic properties of specific areas within the GIT.